In Arabic mahshi means stuffed, and in the Levant almost everything can be stuffed with a vegetarian or meat rice filling from cored zucchini, cored aubergine, peppers, tomatoes, onions, and potatoes to rolled stuffed cabbage, Swiss chard, cauliflower leaves and vine leaves to stuffed chicken and whole lambs; name it we stuff it. Growing up in Damascus there were two dishes in summer we had every single week that is because my mother until today still loves them and the tradition continues. The first was green beans and lamb stew and the second was either stuffed vine leaves or stuffed zucchini and aubergine cooked in sour sauce or both together. Some Damascenes combine the stuffed vine leaves with green beans and lamb stew. My grandmother used to parcel the stuffed rolled leaves into dynamite shaped parcels wrapped together with the help of a sewing thread. As a matter of fact, all stuffed vegetables are cooked with a sour element; I do wonder why? This dish is really delicious, but it is not something I can have weekly because of my tight schedule and the time it takes to roll them. It is served almost at every celebration, special occasions, in honour of guests or dinners. Ramadan and Eid are one of those occasions. For me this dish is comfort food, it takes me back to a warm and fuzzy place in time and I am sure many of you have fond memories. This makes an ideal dish to be part of the Eid table spread as it is very easy to make but does take some time with the rolling if you are not skilled. It can be prepared a day ahead then cooked on the day. * Remove the grape leaves from the jar and cut the stems off if any are left intact as seen in picture. * Bring a pot of water to a boil and in batches drop the vine leaves for 10 seconds and remove to a colander. This is to remove the flavor of the brine. Repeat until all are done. Set aside to cool. * For the filling combine the beef, spices, salt and oil in a bowl with 2 tablespoons water and work it with your hand until it feels soft and buttery then add the washed rice and mix. * Place the grape leaf on the work top with the shiny side down and the stem nearer to you. * Add a spoonful of the filling and spread it horizontally as in the picture and fold the base of the leaf over the filling tucking it in with your fingers. 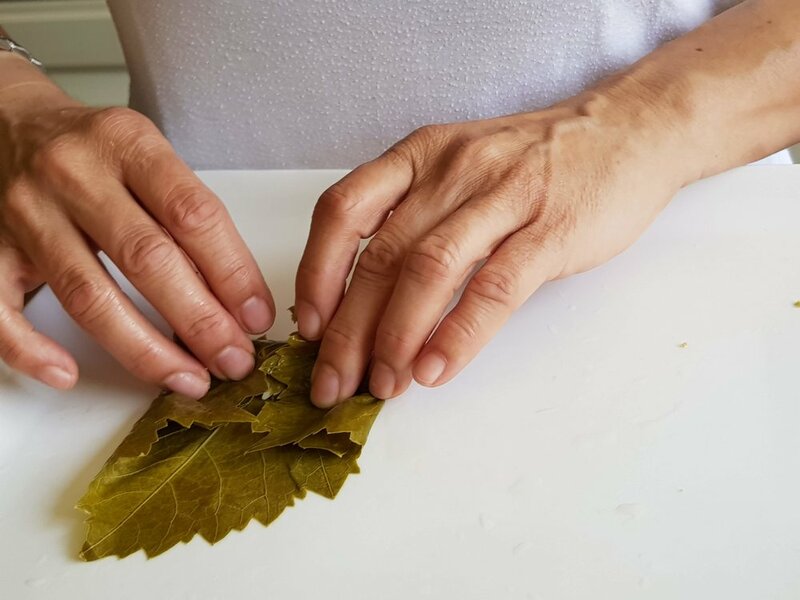 * Fold the right side of the leaf inwards towards the right side of the filling and do the same to the left and roll once, the shape should resemble an envelope. * Continue rolling making sure the filling is firmly tucked and held inside. Repeat the process until all is finished. Place in the fridge until you are ready for assembling the dish. Keep the torn leaves as they will be used for the bottom of the pot. * Place the lamb chops in a pot and cover with water to cover about 4 cm above the meat and boil for 15 minutes skimming the impurities that rise to the top. Make sure the stock is seasoned with salt. * Lift the lamb chops and run the stock through a sieve. Now we are ready for assembling. * At the very bottom of the pot lay the torn leaves (this is to protect the dish in case it scorches). * Add a layer of tomato, the lamb chops then the garlic in the center and stack the vine leaves in a circular mode creating circular layers. * Place a heavy cooking stone on top as seen in the picture. You can use a flat plate that covers the surface and top it with a bowl of water or anything heavy. This is to hold the stuffed leaves in place and stop them from unfolding. * Add 2 liters of the stock and the lemon juice, and make sure the seasoning is correct otherwise it will take the salt from the rice stuffing. Cook on medium heat covered for 40 minutes. * Drain the stock in a glass bowl. * Place a tray over the pot as seen in the picture and turn it upside down. Leave it to settle for five minutes then lift the pot. Serve with the stock and plain yogurt. * Soak the rice for at least 1 hour then wash several times to get rid of the starch. Per Serving: 649 Calories; 23g Fat (34.1% calories from fat); 35g Protein; 64g Carbohydrate; 1g Dietary Fiber; 105mg Cholesterol; 2449mg Sodium.